Eleanor and her research team in Madagascar. Eleanor Stalenberg joins us this week as our featured researcher! Eleanor is an ecologist and animal physiologist from Australia who is currently working towards her PhD at the Australian National University (Canberra). Eleanor uses physiology, behavior, and ecology of wild animals to understand how they are impacted by the environment and how management efforts could be tailored accordingly. 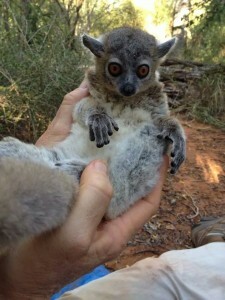 In the past, she has published on these topics as they relate to koala bears, while her current research focuses on the nocturnal and folivorous lemurs (Lepilemur sp.) in southern Madagascar. She studied a Bachelor of Science at Sydney University, has worked as a zoologist and researcher for private, government and non-governmental organizations, and is the co-founder and Research Coordinator at the Development and Aid Worker Network (DAWN). She is passionate about the conservation of endangered mammals and the ecosystems they live in and this is the passion that gets her through those long, hot, and dirty days in the field. Eleanor can be contacted at eleanor.stalenberg@anu.edu.au; more information can be found at www.eleanorstalenberg.com. 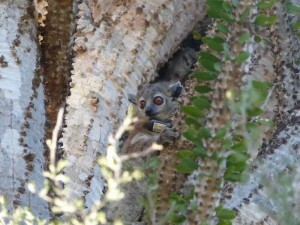 A lemur (Lepilemur) at Eleanor’s study site. I have always loved wildlife and found solace in the natural world. Growing up just outside of Sydney, Australia, I was surrounded by the iconic Australian bushland from a very young age. My mother cared for native wildlife that had been injured, like wombats, wallabies and turtles so that they could be released into the wild again. I developed a strong appreciation for the wonder of nature through this unforgettable hands-on experience and this led me on the path to science and biological research. 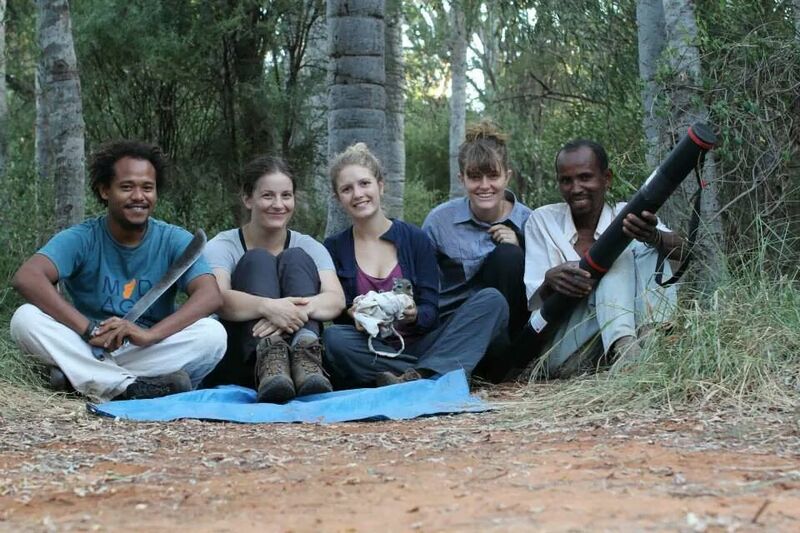 I first became involved in lemur research in mid-2012. Like many biologists, I have fantasized about working in Madagascar and studying its enigmatic and highly endangered lemurs since I first opened an encyclopedia or saw my first nature documentary. In 2012, I was very lucky to be offered the opportunity to work in Madagascar for my PhD research and, naturally, I jumped at the chance. My research on lemurs stems from ongoing research at our laboratory in Canberra that examines the nutritional ecology and conservation status of arboreal marsupials; particularly, koalas. These arboreal marsupials mainly eat eucalyptus leaves, but we found that they will only eat from specific trees with leaves that have the right balance of nutrients and toxins and will seek out trees that they can’t eat for shelter on hot days. When we looked at this at a landscape scale, we found that animals living in areas with low nutritional quality trees and areas that were hotter and drier had less success at reproduction and had even become locally extinct in some areas. All this suggests that leaf-eating mammals are much more limited in their habitat choices and are more vulnerable to environmental change than previously thought. I decided to investigate these important questions in the highly endangered leaf-eating lemurs of Madagascar: the Lepilemur. 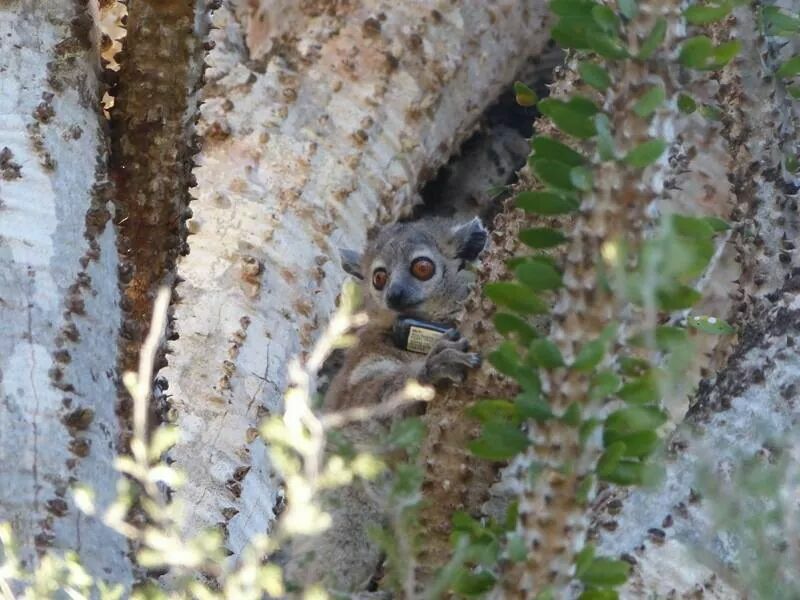 Lepilemur wearing a radio collar. 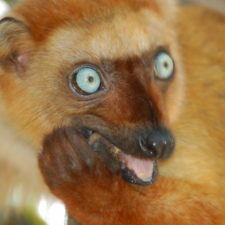 My PhD research is on the nocturnal and leaf-eating species of lemur (Lepilemur sp.) that live in the dry, spiny forest of southern Madagascar. This habitat is dominated by the weird spiny octopus trees (Alluaudia procera) and has very hot summer seasons, cool dry seasons and very unpredictable rainfall patterns and the spiny octopus trees. Previous researchers have suggested that animals living in these extreme conditions are already pushed to their biological limits, making them particularly vulnerable to a changing climate. I am interested in finding out how leaf-eating lemurs cope with the current extreme conditions and predict how the regions climate will change in the future, if lemurs will cope with these changes, and possible methods of management that will help them adapt. I draw on various disciplines of science to answer these questions, including climate science, population ecology, animal nutrition and animal physiology. These disciplines are linked in a ‘mechanistic framework’ to model animal responses to their environment from first-principles of biomechanics. With this technique I aim to determine the factors that limit Lepilemur distribution and abundance and also identify new habitat that can be managed to safeguard the species into the future. It has been a very interesting and challenging research journey so far, but one that I feel will contribute greatly to the conservation of lemurs and other animals in this harsh and sometimes forgotten region of Madagascar. Along the way, I have asked specific questions about Lepilemur physiology, behaviour and ecology. For example, I have investigated how much energy and water Lepilemur use during the day in summer and winter; measured their short-term water loss and metabolism in response to different temperatures; and investigated how the nutritional quality and water content of the leaves Lepilemur eat changes with different seasons. This project is significant because it addresses an urgent conservation goal to develop rigorous predictions of the consequences of a changing climate for endangered mammals and informs land management and restoration initiatives (such as SuLaMa) to assist native species adapt to climate change. 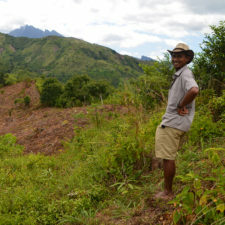 I work at Berenty Private Reserve, 90km west of Fort Dauphin in the south east of Madagascar. Established by the de Heaulme family in the 1930’s, Berenty now operates as a privately-owned tourist park and sisal farm. There are small patches of original dry deciduous gallery and spiny forests which have been the location of many important scientific studies since Dr. Alison Jolly started working on ringtail lemurs in the 1970s. The de Heaulme family are very supportive of scientific research and invite researchers and students to stay at the Naturaliste accommodation. There are 3 sleeping bungalows, a large common room, two bathrooms and a common kitchen. There is running water that is pumped up from a well, generator power and even mobile phone reception! We are often woken by the cheeky lemurs pounding on the roof of our sleeping cabins. 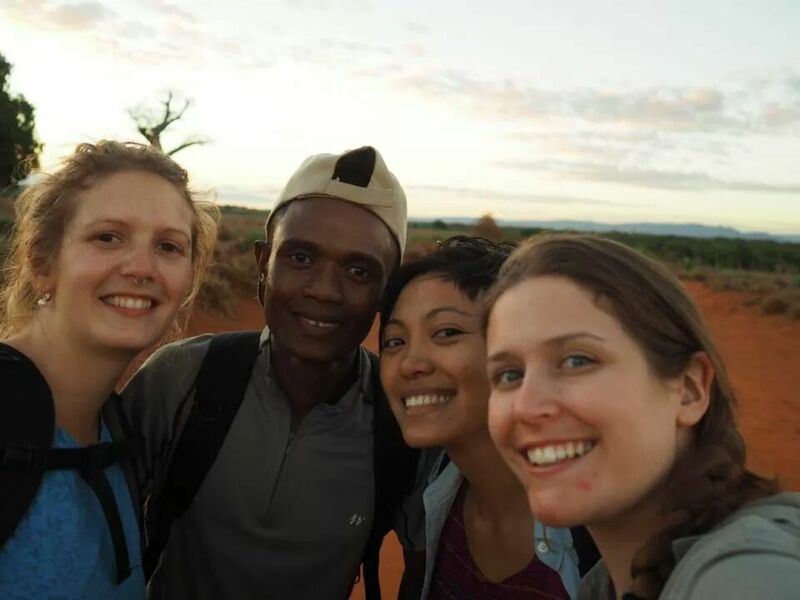 I work with a team of four or five in the field: myself and a collaborator from Hamburg University, Malagasy assistant ecologists, and one or two international volunteers. I also hire guides and assistants from the local Berenty village to help with the work, security and camp life. Lepilemur are nocturnal and so it is important for us to follow them at night to find out what trees they like to use for eating and resting. So we start very early in the field, sometimes at midnight or 3am and head out into the spiny forest to track lemurs and monitor microclimate using a portable weather station. We do this for 2 hours each night on rotating shifts for the entire field season, each night 2 hours later than the one before. During the day, we conduct respirometry experiments, track lemurs, measure microclimates, collect leaves from the octopus trees, and capture Lepilemur with a blowpipe to measure morphology, health and metabolism and collect faeces, fur, blood and tissue samples. We also prepare meals for ourselves and do the housekeeping. So you can see why we need such a large team. Eleanor (left) with her research team in Madagascar. The hardest part about working in a remote place like southern Madagascar is the logistics. In field work there are many, many things to think about and plan for, some expected and some not expected. It is important to plan for equipment failures and bring back-up supplies because you can’t just pop home or to the local hardware store to top up supplies. I always say to my volunteers and collaborators that if they need something, bring two. Then there are the countless permits and approvals you have to take care of before you start work and these can be difficult to keep track of if the rules change, as they sometimes do. But these hard moments are far outweighed by the joy of waking up to ringtail lemurs sunbathing on the roof of your bedroom. The biggest threat to lemurs in the south is habitat clearing and degradation combined with climate change. 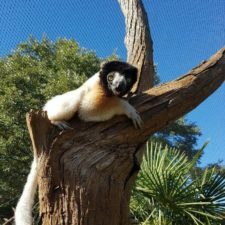 My research is suggesting that increasing hot temperatures and heat waves predicted for the region will lead to increased risk of dehydration and heat stress in lemurs. Lemurs live in reasonably high densities in the remaining forest patches, but their dispersal ability is limited and this makes them very vulnerable to a changing climate as there will simply be no place for lemurs to go. 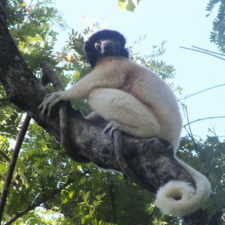 It is important that land managers and researchers work with local communities and industry to stop the clearing of habitats where there are existing lemur populations, improve habitat connectivity around these areas and select habitats to rehabilitate in locations where we predict will be climate refuges in the future. This would also be helped by improved access to existing climate data from the southern region and increased investment in climate monitoring across the country. More research needs to be done to characterize the physiological limits of other lemurs in the region to define their vulnerability to climate change and understand what conditions they need for long-term population survival. 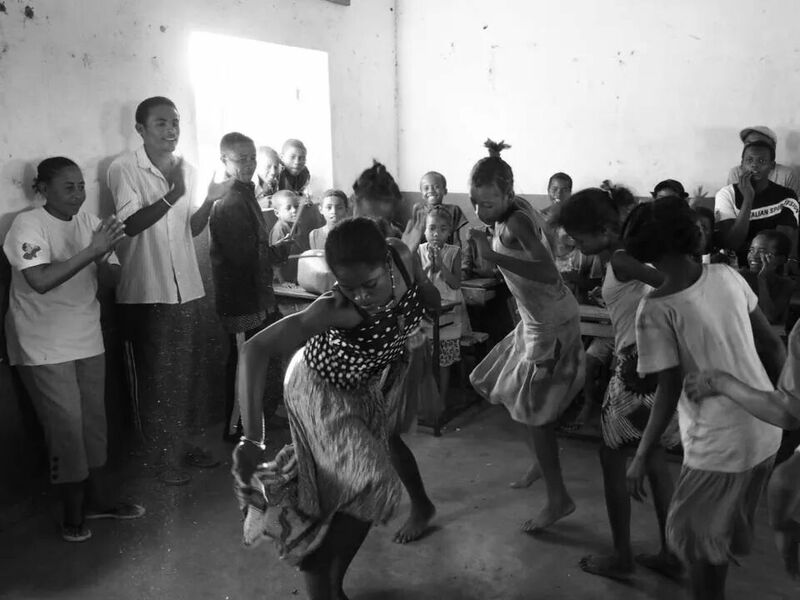 It is also vitally important that researchers from outside Madagascar continue to work side by side with Malagasy researchers, communities and land owners to develop ongoing partnerships and practical conservation programs. The employment and education of local people plays a very important role in ensuring the success of conservation goals. The most special moment for me of all my work in Madagascar was the first time I held a Lepilemur in my hand. It was a really hot day and it had been licking its forearms to cool itself down. This simple observation really struck a chord with me because it showed clearly the risk of dehydration and heat stress posed by a warming climate. Like many folivorous mammals, Lepilemurs can only replenish their water from their food or from dew. It hadn’t rained for ages at that time and so I could see that this animal probably lost a lot of water trying to keep itself cool. Collecting data from a Lepilemur in southern Madagascar. 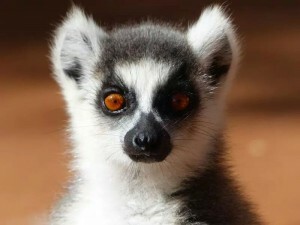 Thanks to popular cartoons and nature documentaries, lemurs are well-known and well-loved around the world. In spite of their popularity, few people realize the dangers lemurs face to their survival. More importantly, even fewer realize that in spite of these threats, there is still hope for their conservation and that we have a plan to achieve this. I hope that in ten years, after implementing the actions of the Lemur Action Plan, we have been successful as a global network of scientists, conservationists, land managers and concerned citizens in bringing lemurs back from the edge of extinction. I hope that my research plays a role in this national and global effort of lemur conservation through increased education, training and collaboration with Malagasy people in Madagascar, increasing our knowledge of lemur biology and ecology; improving the accuracy and reliability of climate modeling in Madagascar; informing management decisions on lemur conservation and reserve networks; and by reaching out through the media and internet to bring the plight of lemurs and the plan for their conservation to the entire world. Support organizations that are actively working in the Berenty Reserve!